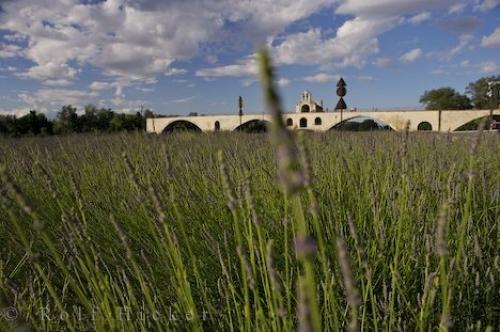 Fragrant lavender fields near the Pont St Benezet on the Rhone River in Avignon, Provence in France, Europe. Photo of fragrant lavender fields near the Pont St Benezet in Avignon, Provence in France, Europe. ... Lavender field backdropped by the Pont St Benezet and the Chapelle St Nicolas by the Rhone River, Avignon, Vaucluse, Provence, France, Europe. I photographed this photo with the digital SLR camera model Canon EOS-1Ds Mark II, aperture of f/7.1, exposure time of 1/250 sec. on ISO 100, as always I used a original Canon Lens, the focus lenght for this picture was 24mm.